Starring Patricia Barry, John Baragrey, John Fiedler. Written by Donald S. Sanford, based on the short story by August Derleth. About to be executed for witchcraft, Meg Peyton (Pamela Searle) requests that the hangmen leave her wig on. After she hangs, it becomes evident why: the wig has magical powers that keep the wearer young as long as it's donned. Washed up Hollywood star Sheila DeVore (Barry) has decided to make her comeback in a big budget bio of Meg Peyton and is determined to wear the famed wig to get her into the role. The cursed rug does the job. PE: Never mind the wig, it's the hats that gossip columnist Arabella Foote (Linda Watkins) wears that are dangerous. JS: No kidding—I was particularly scared of the wicker trash basket she wore. PE: Patricia Barry is perfectly over the top for the Marilyn-esque role. And this is not an easy episode to rate. I appreciated its tongue-in-cheek storyline (at least I hope that's what they were aiming for) but it's a bit slow. JS: I do think the episode is intentionally tongue in cheek, as there are several moments where they rely on the good old sitcom music. And the casting of Herbert Rudley as Max Qunke seems to support that as well. I must also point out that Patricia Barry is looking fantastic this time out (once she dons that magical wig). PE: The dopey flailing monster gloves (leftovers from The Leech Woman?) ruin every atmospheric shot they're stuck in. JS: I'm betting the original Thriller-boys will comment on how effective said gloves were on that cold January night back in 1962. I didn't mind them myself when they were used in a scene, but agree they were far less effective when shot as disembodied arms against a black background clutching at the camera. Perhaps the interpretive dancers from "La Strega" were on the Universal payroll, as those shots look suspiciously like their handiwork (no pun intended). PE: For the biggest star in Hollywood, her party (where the partygoers are twisting the night away) is a pretty cheap affair. It appears to be held in someone's living room and attended by Brigham Young students. JS: I kept thinking that had this only been shot a few years later, Ann-Margret would have been perfect in the role of Sheila... particularly for the dance sequence at the party. Nobody could shake the fringe quite like A-M could. PE: Remember the next time you're running through the streets of Los Angeles to beware of falling Roman columns. JS: That is actually a valid concern when running through any studio backlot, Peter, and not one you should make light of. PE: Devore's monster visage in the reveal is a very effective combination of Harry Townes' make-up for "The Cheaters," and a coral reef. It reminded me a bit of the human end of The Fly as well (the finale in the spider's web, that is). PE: Pay attention and you'll notice that Devore's maid, who inherits the wig after Miss Devore is squished, has a mustache to make her homelier, I guess. When she dons the wig and escapes out the back door (after changing into nicer clothes in faster time than it takes to paint masterpieces around these parts), she's Meg Peyton, gorgeous and clean shaven. JS: Um, isn't that the whole point? This is a supernatural episode, and not one of your crime dramas, mind you. 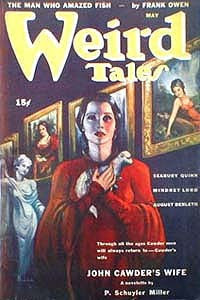 PE: "A Wig for Miss Devore" appeared in the May 1943 issue of Weird Tales. Derleth's story is quite different from the Thriller. In the original story, the prologue is dispatched (the murderess is more contemporary), there are rules cited for the wearing of the wig (the wig should not be worn more than a few minutes at a time, it should be kept out of sight, and that it had "certain properties not subject to reasonable explanation"). Miss Devore also becomes hungry for raw meat, in particular human hearts. When she chows down on her publicity manager's ticker, she's carted away to the asylum. End of story. 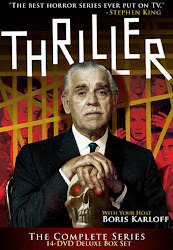 PE: Steve Mitchell gets a fabulous commentary out of Patricia Barry, who dishes out lots of behind-the-scenes info and gossip about Thriller and Hollywood. Barry lets us in on her relationship with her husband, writer Philip Barry, Marilyn Monroe, old Hollywood, and the dynamics of making the episode. Neither Mitchell nor Barry gloss over the cheesier aspects of the show. A silly premise, implausible plot contrivances and a shallow picture of old Hollywood that, after 'Sunset Boulevard' rings utterly vacant. Watchable due to it cheesiness but one that fails on all counts and rings false in every way. I liked this one alot and gleefully laughed all through it. Patricia Barry's twist dance was hilarious. I see it as an outrageous comedy. Hey, why shouldn't THRILLER do at least one 50s B-movie Roger Corman refugee? In fact, it reminds me of THE WASP WOMAN with Susan Cabot. And I didn't see this as a kid, but those damn rubber monster hands were so incongruous they were actually effective in a crazy kind of way. As well as the final "monster face", which was monster mag cover-worthy. That's what this episode was: crazy and lots of B-movie fun. Perfect one to say HAPPY HALLOWEEN! An episode liberally laced with "cheese", and delightfully so. I enjoyed this show MUCH more than I have in the past, because I sat back and allowed myself to chuckle at all of the stereotyped Hollywood folk, as well as Patricia Barry's beautifully balanced performance. It seems that Sanford and Brahm were winkin' and nudgin' us all the way through this one, in a great send-up of B-horror flicks. I love the "gloves of doom" shots, which seem to be intended as part of the stylized fun of the show; the Menu still of the hands clawing at Linda Watkin's face reminds me of the next-to-last panel of a Graham Ingels tale from "Vault of Horror" (is that the title he usually did?). All roles were excellently cast. Impressive that Thriller went to the expense of filming the period prologue; nice connection to the main story (though the "modern" onstage set and filming looked REALLY tawdry). 1.) Shiela is supposed to be fairly seriously over-the-hill in the opening scene (at age 38); so why didn't the Thriller crew AGE her at all? A white wig and sunglasses don't cut it! (Much the same problem as the TZ/Lupino "16mm Shrine"---if Lupino looks fabulous and flawless throughout, then you DON'T HAVE A STORY!). A little aging on Devore would have gone a long way towards a convincing "rejuvination". 2.) The loathsome, reprehensible, revolting, putrescent "TWIST!" scene---the thing goes on for almost 3 minutes! The dance was just beginning to take the country by storm and, probably lacking a few minute's running time, the episode gets saddled with this thing (though it also seems to confirm that the tone of the show WAS intentionally tongue-in-cheek). ON THE OTHER HAND--the very last shot (with the sultry, jazzy trumpet tune and piano riff), still-framed for our surprise and delight, is one of the cleverest, most PERFECTLY gauged things I have ever seen on TV---ever. Wonderfully witty and, I think, another clear indication of the show's intentionally comic tone. Outrageously horrendous make-up for Sheila's demise--and the camera LINGERS on it! Serves her right for that repugnant twist. A bit slow at times, but overall, a real treat of a show. Nice job, Big Steve, for expertly "leading the witness" in your interview/commentary. EIGHT and One Half Balding, Coral Reef Karloffioan Heads. PS-- At least once per Thriller season, Linda Watkins plays a nasty critic who wears some crazy crap or other on her head. Did Hubbell Robinson have something for double-jointed dancers, because this was the second time in a short time that the inspiration for Elaine Benes were given plenty of camera time. Of course, I forgave them for that interpretive moment in La Strega, and i do the same thing for 'Wig'. It was a fairly fun hour, with a few shocks and a number of nice performances. While many of the roles were cut from the 'ain't hollywood a gas?' stock script, the actors gave it their all. And while the gloves didn't fool anyone here, i think they were meant to be less of an evil reveal for us than they were to represent a near-comical ending for the person that was on the carved end -- ala Creepshow's the cage. And did anyone else catch what looked like a 3-foot forehead on the original Meg Peyton, which made me double-clutch more than the Bob Dylan-like 'stache on the maid. Seven and a half wigged Karloffs! This episode works for me for a couple of reasons. Firstly, it was fun without trying to be a comedy. I profess that horror comedies are one of my least favorite sub genres, so it was nice to see everyone having fun without trying to milk the laughs. Secondly, this show benefits from an overall solid cast. Sure some of it is "on the nose" like HERBERT RUDLEY, and JOHN BARAGREY, but all the casting really fit nicely, I thought. Finally, I love movies about the movies: good, bad, doesn't matter, and "WIG" fits the bill. Okay, I'll admit it... back in 1969 / 70 I use to watch "BRACKEN'S WORLD"...friday nights on NBC. MISS DeVORE would have worked as an oddball entry for that series as well. John mentions the tongue-in-cheek humor in the story. If you read Derleth's original tale, it definitely is intended as a satire on the subtle savagery of Hollywood and the celebrity life. The story was published in Weird Tales in 1943, and I've always wondered if this wasn't an instance of Derleth trying to write the kind of story that Robert Bloch excelled at. Granted, Derleth was starting to write macabre stories with a little more humor in them at this point, but he wasn't above mimicking the style of his pulp colleagues (especially those whose work he published). Black comedy of this stripe on a Hollywood theme was a Bloch specialty. A middling episode. Not at all thrilling, or even eerie, but fun. I agree that Patricia Barry's twist and Linda Watkins' hat were both hilarious. I think I'd give it two and a half Karloffs out of four. happens to be haunted and is responsible for many murders through the centuries. Oh really? A museum? OK. Also the column for some reason falling over and killing her made me laugh and not in the good way. I saw it when I was about 12, thought it was really scary, and not funny at all. One of my favorite episodes. I consider it a much more exciting and suspenseful horror episode than, say, The Hollow Watcher, or Dark Legacy, or even Well of Doom, stuff other people like. Really captured that old Weird Tales magazine feeling that I enjoyed about Thriller. The final ghastly makeup by Jack Barron did not disappoint, and was pretty pungent for the old Ozzy and Harriet days. If you're going to say worst of the episodes, you probably mean worst of the real horror episodes, not including all those crummy crime exercises. The plot didn't always make perfect sense logically. Neither do nightmares. The delayed letter is what you'd call a necessary plot device. Those aren't always easy to smooth over with some lame excuse. It was curious that when she took the wig off she became a hideous abomination instead of just 38 year old Sheila again, but someone said it's a devil's bargain. Patricia Barry was actually 40 at the time. Now she's 90.
to be the equivalent to nails on a blackboard. Those thrifty Thriller execs start things off by transporting us back to the set of Guillotine. A pretty young witchy lass suffers the same fate as Robert Lamont. Fast forward to the modern era and an nebbish studio drone is helping an aging washed up diva ascend to her glory days once again. 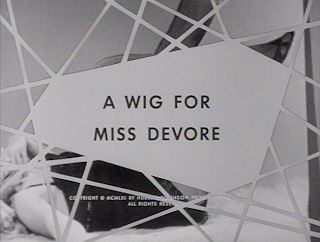 The wig in the episode's title helps Miss Devore do just that. Patricia Barry plays her part with devilish relish. It's a delight to watch her exact revenge on her old Hollywood compatriots who discarded her the second she became yesterday's news. Barry in her role reminds me a bit of Jo Van Fleet in The Remarkable Mrs. Hawk. Both of these mature ladies with pent up sexual urges take wicked enjoyment in their disposal of those in their way. 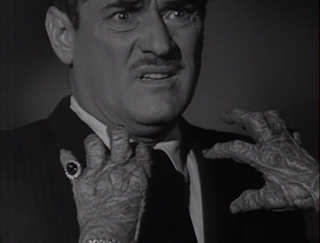 Mad props to the Thriller special effects department for creating old Mrs. Devore's killer paws. I couldn't help, but chuckle at those strangulation scenes. Since Mrs. Hawk finished off her episode on top, I wasn't sure how Miss Devore would fare. I read that the tawdry Hollywood scene aspect of this entry turned off some, but it played as a guilty pleasure for me. I'm glad that others pointed out Miss Devore's maid's obvious 'stasche. For a second there I thought that I was seeing things. After the maid donned the wig she suddenly changed into Barbara Eden. I thought that Miss Devore was good fun with a bit of camp thrown in. 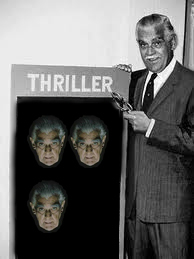 Two and a half Karloff wigs. I was 11 when I saw it and it scared the heck out of me. Now that Thriller is back on tv I hope they air it so I can see if it's still frightening or if it's as corny as this article says. You can: Watch your local station which subscribes to the "Me TV" channel. I just saw this episode uncut. (I was 9 years old when I first saw it in 1962). I had just turned 8 years old when this originally aired and watched on our small black and white television and I was terrified, especially that last scene with Miss Devore sans wig. I wasn't aware of Thriller until Me-TV started running it and I love it! I would love to hear some of Ms. Barry's dish (especially about Marilyn! I kept thinking about how this was shot in early 1962 ... Marilyn died in August of that year at 36 and there's that crack about Sheila being an old bag at 38). Looking up Ms. Barry, I didn't realize her husband was the son of Philip Barry the playwright! Got a chance to watch this one last night -- probably my favorite now. I've seen 10 or 12 of the most heralded episode, and something about this one just grabbed me right. Loved the commentary, too. Great to hear Patricia Barry talk about her experience hamming it up. There have a couple of snide comments here about the improbable demise of Sheila DaVore beneath a fallen Roman column, but I submit that's unfair criticism. It's clearly a case of "instant karma" for the killing of Arabella Foote. By falling on her, it was only looking out for its own, because Arabella Foote, after all, was a gossip COLUMNist. Twist Party!! What's the problem with a twist number near the end of one of the most successful of the horror episodes of THRILLER? Twist numbers appear in large numbers of movie and TV series circa '60 - '62 for the same reason that every other movie from '40 - '41 had a conga number: both were dance crazes that really swept the country. Unlike, say The Continental or the Cha-Cha, The Conga and The Twist were easy to learn and fun to do. And this episode is fun from beginning to end. I've been seeing these THRILLER episodes on MeTV, not in a re-issued set, but I'd almost be willing to get it just to hear Patricia Barry's take on this episode. I think 'A Wig For Miss Devore' is the best of those supernatural tales which featured aging female stars in the early '60s. Can this ambivalence toward a sturdy generation of divas be an accident? 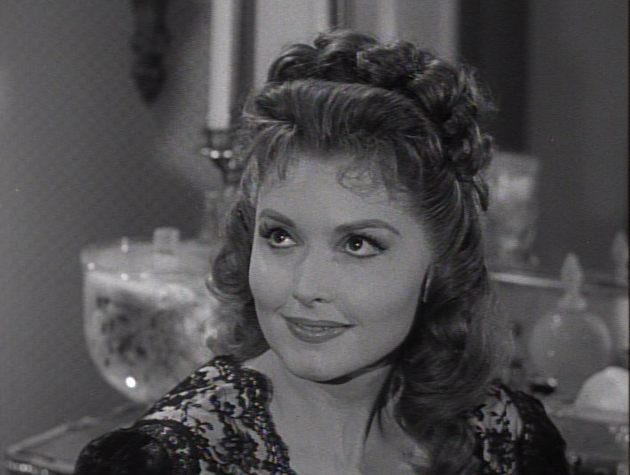 THE TWILIGHT ZONE's 'The Sixteen Millimeter Shrine' anticipates Woody Allen's 'The Purple Rose of Cairo' by a couple of decades, while 'Queen of the Nile' re-cycles a dishy bit of Hollywood diva-lore: in that 1964 episode of TZ, the ageless beauty turns out to be a centuries-old Egyptian, whose ancient "mother" is really her daughter, a neat inversion of the tale that mixed race star Merle Oberon used to palm her Indian mother off as her ladies' maid. About ten months after 'A Wig For Miss Devore' aired, WHATEVER HAPPENED TO BABY JANE? was released. This low-budget grand guignol soap opera was considered a tasteless joke in Hollywood until it cleaned up at the box office. Americans of all ages were willing to see the older female stars as scheming madwomen -- isn't this what had kept them on top for so long? It can't be an accident that this was all happening at once, and that some of the most beloved woman stars of the '30s and '40s spent the rest of the decade in thrillers and horror movies. Yes, the horror gloves are silly, but that's mostly because of the slow-mo, floaty way they are shown in close-up. If they had rapidly headed to claw faces or throats, they would have been much less risible. And the makeup on Barry at the end is terrific, probably the most successful horror makeup of the series. She really looks like something exhumed from the grave, moldering and putrid. And the ALL ABOUT EVE ending, transferred to the horror genre, is just the perfect touch to a witty, over-the-top meditation on Hollywood, beauty, stardom and aging. Where the most important thing a star can be is young and beautiful, is any price too high? At least Miss Devore went out on a hit movie! I missed this one when first aired. I was 13 at the time. Yup--ME TV allows us to miss a few knowing the episodes will be repeated, at least up to now. So, it's on at 2:00 am central tonight, 10 Apr 14. I'll have to set the alarm to wake me up in time failing a way to record it whilst I sleep. Indeed the opening scenes with Sheila in her all white wardrobe and hair with movie star sunglasses and baby voice certainly echoes Marilyn Monroe. But, she was older at 38, and Barry was a full 6 years older. The intent may have been actual as Monroe had been off the screen for over a year, something she had done previously, and when this was aired had not started her final never finished film. There are some uncomfortable parallels. Odd?